What is Beep Xtra all about?! OK, so this guy goes into a shop to buy something, anything, meat, bread, cakes, shoes hey he can even just go into a barbers for a haircut are you with us so far? He pays full price but the retailer asks him……….. Have you got a Beep Xtra card? How much is the Beep Xtra card? Just type in your name & details here on the Beep Xtra touchscreen tablet, and that’s it you get 10% cash back onto your card from the haircut discount and now you can spend it anywhere, anytime you see the Beep Xtra sign around the world………..
Just before the retailer gives the guy his Beep Xtra card he notices he has a smart phone and says, if you like I can put this cash back discount app straight onto your phone we don’t need the card if your phone can take the free app…………wow are we impressed yet? So the guy leaves with his new haircut and that night he goes out for a meal in a restaurant, or a take-away, or maybe he goes for a round of golf in the afternoon, still following us? 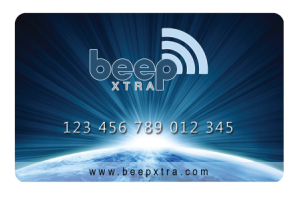 Do you accept Beep Xtra cards here’? The answer can be either Yes or No. If Yes he goes in, if No he could ask the restaurant why as it’s a free service and he could invite the restaurant to join Beep Xtra………. or he could go elsewhere which will pretty much make sure the restaurant has a good think about joining Beep Xtra! Anyway let’s suppose they do accept Beep Xtra already……. So what do you think happens when he pays for the meal? So the waiter waves his card (or smart phone) within range of the near field communicating Beep Xtra screen and the system says yes he has money on it to spend and the money he was awarded in the barbers now comes off his meal……….. Is he impressed? How fast do you think his wife will get the message? How many seconds before his wife has her own card or app on her phone? So they guy (and his wife) get their cash back everywhere they see the Beep Xtra logo, but we’ve only just started……………. They look at the Beep business opportunity and they realise that for free they can replace their incomes if they choose, the guy only went out for a haircut and he came back staring financial freedom in the face. They think about a friend or relative of theirs who runs a shop or business a Grocers a Mobile Phone Shop anything and they wonder if they would be interested in becoming a Beep Xtra business partner, and they realise that when they bring in this business partner to Beep Xtra, they will earn perpetual income from this! In short they realise like most of you will do soon………. if you haven’t already………that Beep Xtra is a whole lot of great things that’s available right now no waiting, global right now, in many languages right now and folks its……… Free!!!! What is Beep Xtra all about?